North Kitsap and Archbishop Murphy play tonight at 7 p.m. in the first round of the Class 2A state tournament. 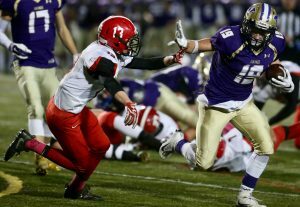 North Kitsap’s football team puts its 10-0 record on the line tonight at 7 p.m. in Poulsbo against Archbishop Murphy. The Wildcats (10-0) are the top-ranked team in Class 2A. Can the Vikings — ranked No. 6 — pull off the upset? 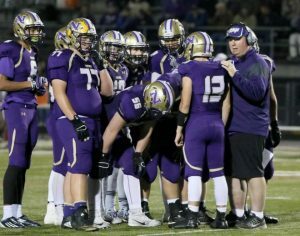 Tune in here at 7 p.m.
-Austin Miller writes about how the Vikings are anxious to take on the challenge of facing the same team that knocked North Kitsap out of the state semifinals last year. -Jeff Graham writes about his past experience with covering games featuring undefeated teams. Here are the regular season scoring leaders for both girls soccer and boys soccer (Crosspoint only). North Kitsap’s undefeated football team is ranked No. 6 among Class 2A teams in the final Associated Press state football poll. The Vikings (9-0) host Orting on Friday at 7:30 p.m. in a West Central District playoff game. The winner advances to the state tournament. Others receiving 6 or more points: Lincoln 10. Others receiving 6 or more points: Sunnyside Christian 12. North Kitsap is looking to finish the regular season with a 9-0 record. The Kitsap Sun’s livestreamed Game of the Week features Bremerton at North Mason. Click here to watch the game at 7 p.m. NOTE: Klahowya’s nonleague game at Bellevue Christian (5 p.m.) is Saturday. The game was originally scheduled for tonight. —Diyamante Hall scored on the Knights’ opening possession and the Knights never looked back and clinched the Olympic League 2A fourth and final playoff berth into districts. —Running back DeAndre Sincere went over 1,000 yards in the Cougars’ win. Here is a roundup of Friday’s action. —Six different Vikings scored touchdowns in the first half to lead North Kitsap’s pursuit of an undefeated regular season. The Olympic League 2A champions host a district playoff game next week. 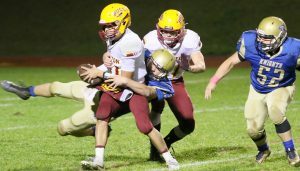 —Gavin Velarde put the Wolves in front with an early touchdown as the Wolves extinguished the Bucs’ playoff hopes. —The Trojans secure the Olympic League 2A No. 3 seed into the district playoffs. —The Wolves fell to 1-8 overall. Central Kitsap’s DeAndre Sincere is closing in on 1,000 yards rushing. North Kitsap continues to reside at No. 7 among Class 2A teams in the Associated Press state football poll. The Vikings (8-0) look to complete a perfect regular season with a home game against Tenino on Friday. Bremerton took control of its playoff destiny Friday with a 40-6 win over Kingston. —The undefeated Vikings captured the Olympic League 2A title. —The Wolves clinch the Olympic League’s No. 2 seed into the district playoffs. —Gabe Wallis had three touchdowns for the Eagles in the first half.